PHILADELPHIA - March 4, 2018 - PRLog -- Due to the high level of community interest, and the generosity of sponsors, listeners, family, and friends,"Mark & Denise in the Mornings" is expanding to two full hours, five days a week. You can now hear morning radio hosts Mark "The AME" Tyler and Denise "The Writer" Clay from 7:00 AM – 9:00 AM, Mondays through Fridays on WWDB, 860AM radio in Philadelphia, or on Facebook Live. You can also download the podcasts minutes after every show from the WWDB website or via Itunes on your Apple device. The popular radio hosts have developed a tremendous following since launching on the new station less than two months ago. Listeners and supporters went into their pockets to donate money to a Go Fund Me Campaign to keep "Mark & Denise in the Mornings" (https://www.gofundme.com/markanddeniseinthemornings) after the two departed their old radio station. So far, the show has raised more than $10,000 in donations and sponsorships. The first major sponsor to step up was POWER (Philadelphians Organized to Witness, Empower, and Rebuild) (https://powerinterfaith.org/), an interfaith movement, who will continue partnering with the show to address issues affecting the Philadelphia Community at large. Mark Tyler and Denise Clay are known for their innate ability to inform and entertain while engaging listeners on news topics of local, national, and international interest. Mark brings the unique skills of an orator mixed with humor while Denise blends her insightful wit and media savvy as the foundation for getting to the heart of the matter. Together they have created a style and program that's resonating with the city of Philadelphia like no other morning show before them. Though based in Philadelphia, the pair tackles topics of a national and international scope appealing to an audience of the same thanks to their vast reach on social media. Mark on their new show: "We look forward to expanding our reach and being able to present the type of programming that gives voice to local, national, and international newsmakers of the day from the Black experience," said Tyler. "Our show is progressive talk radio that lifts up the often-underreported experiences of the African Diaspora." Denise Clay is a long-time, respected Philadelphia journalist who writes for Philadelphia Sunday Sun, Philadelphia Magazine, and The Philadelphia Public Record. Denise is known for her journalistic integrity and diligence in seeking clarity on issues pertaining to Philadelphians. She is a graduate of Temple University. Denise on their new show "I'm really excited about the opportunity to continue our momentum for two full hours and for five days a week," said Clay. "I look forward to interacting with dynamic guests and engaged listeners in Philadelphia and beyond." 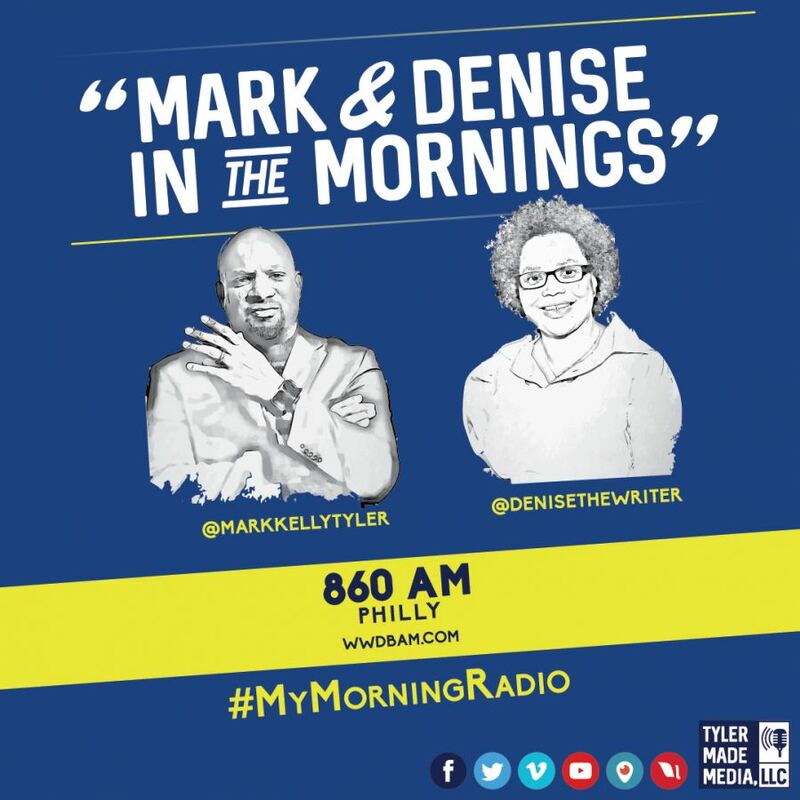 "Mark and Denise in the Mornings" is the media venture of Tyler Made Media, LLC., a national media company based in Philadelphia, co-owned by Mark Tyler and his wife Leslie. The company also has other media interest and clients with plans for future development in digital and print media. For all media inquiries about "Mark & Denise in the Mornings," or to schedule an interview, please contact Tyler Made Media via email leslie@tylermademedia.com (mailto:leslie@tylermadepr.com), or cell phone (609) 247-2632 (tel:(609)%20247-2632).